Had I not known otherwise, I would have thought these recordings were those of famous big bands such as Glenn Miller or Tommy Dorsey, but in fact, they are the original recordings of our own classmates, the "Regenaires"! I am really impressed by their talent! Interpreting musically the finest in expressive sounds was Reseda's dance band, the "Regenaires". With several television appearances on "Spotlight on Youth" to their credit, these Regenaires continued to draw applause at campus dances, outside dances, and at assemblies and concerts. With Jim Peck, the student director, and Mr. Gagliardi, the faculty director, the "Regenaires" worked for fun, vocational training, experience and money. Auditions for membership were held and only the very select musicians were chosen. 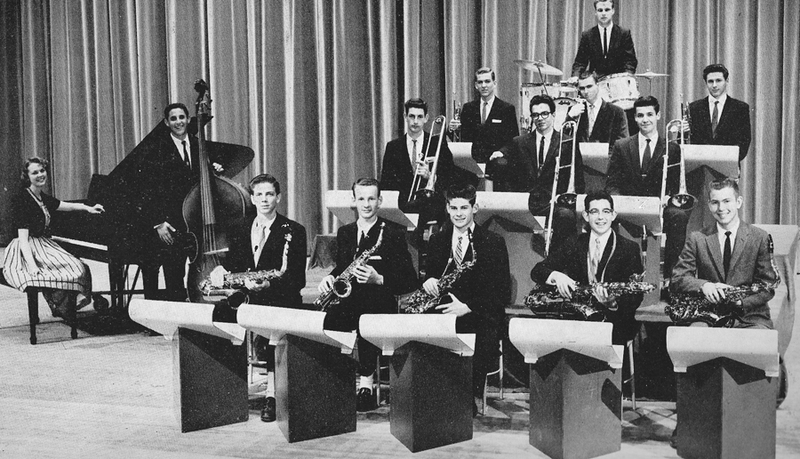 The members felt the opportunities for individuality in music were one of the finest exponents of Reseda's dance band. courtesy of Mike Clarke - drummer for 1959-1960 "Regenaires"
You may click on the mp3 songs listed below to listen to the original recordings of the "Regenaires"
(Download time is dependant on the speed of your Internet connection)"